The Friends of Lewes’s “Lewes Street Elms” project aims to restore the avenue of Elm trees on St Anne’s Hill, Western Road, and at the same time to create a beautiful, green and healthy gateway to Lewes High Street. These elms will improve the health and biodiversity of the environment for birds, bees and humans, by reducing pollution, producing oxygen, and helping to avoid water run-off. The original seven Elms, dating from about 1900, have now all been felled because they had Dutch Elm Disease. 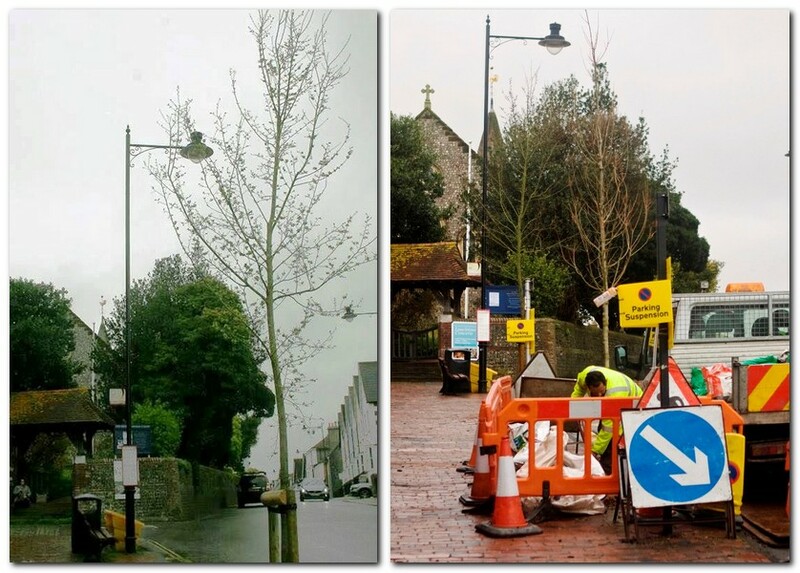 The photo on the left, below, shows one of the two new DED-resistant Elms already planted on this site in March 2017, thanks to the support of East Sussex County Council, Lewes Town Council and a generous donation from a member of the public. On 15 March 2018, the ESCC arranged for another new Elm tree to be planted at St Anne’s Hill – photo above, right. The Friends of Lewes and The Chalk Cliff Trust contributed to the funding for this. Tesco has already granted a further £1,000, and this sum could be increased by the supermarket’s blue tokens voting scheme during March and April 2018. 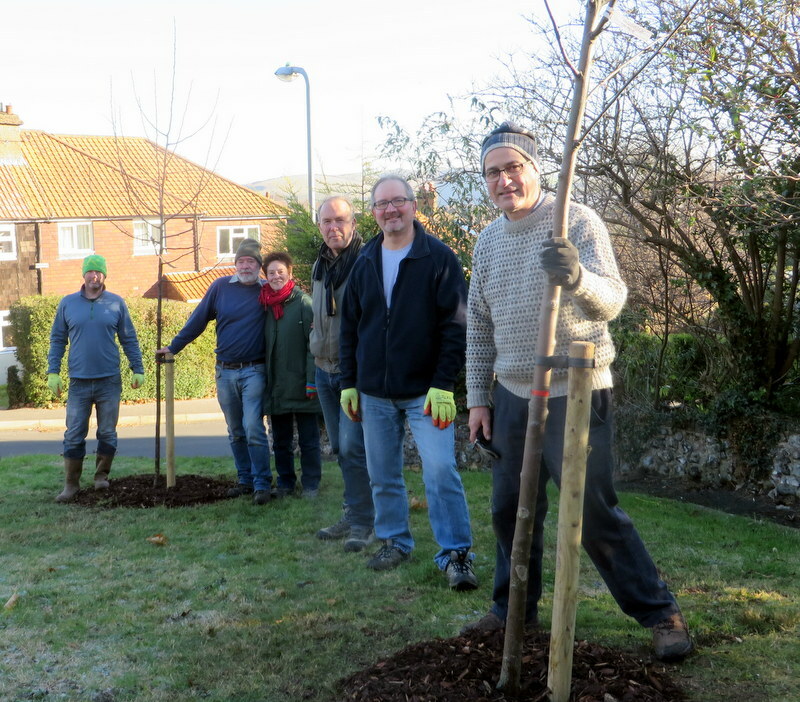 On Sunday 11th March the Trees Committee of Friends of Lewes, helped by some of the residents, planted twelve trees in Houndean Rise. In recent years many trees had to be felled and have not been replaced. We chose the trees, in consultation with the residents, for a mix of Spring and Autumn colour. They also had to be varieties which would prove resilient on such narrow, chalky verges. It had been quite difficult to find individual sites for each of the trees, because of the complex network of underground utilities shown to be under the street, but we managed to find a place outside each of the homes where a resident had agreed to look after one or more trees and water them. The trees are: 2 x Acer Campestre Elsrijk, (Field Maple); 2 x Pyrus calleryana Chanticleer, (Ornamental Pear); 3 x Prunus padus Albertii, (Cherry); 2 x Prunus Umeniko, (Cherry), 2 x Liquidambar styraciflua Worplesdon, (Sweet Gum); and 1 x Cercis siliquastrum, (Judas Tree). Thank you to everyone who helped to make this possible. On Sunday 19th March the Trees Committee of Friends of Lewes revisited Abergavenny Road to plant a further nine trees on the grassy area at the top of the bank. The trees are all native trees which are good for wildlife: Alder, (Alnus glutinosa), Himalayan Birch, (Betula utilis Jacquemontii), Wild Cherry, (Prunus avium), and Field maple, (Acer Campestre). Following requests from, and consultations with, the local residents, the Trees Committee of Friends of Lewes applied for planting licences for replacement trees in Middle Way, Valence Road and Abergavenny Road. We worked with LDC and ESCC to secure the extensive utilities surveys necessary before planting permission was granted. 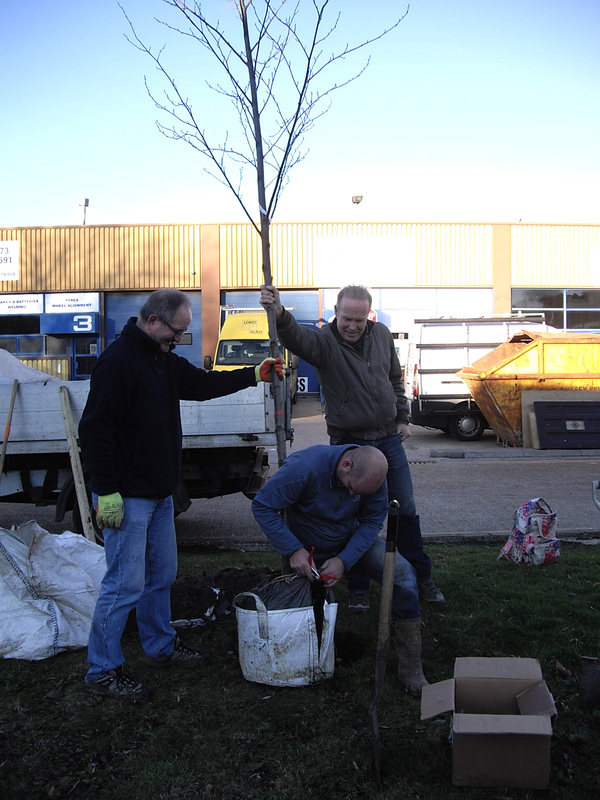 In December 2016, the Trees Committee planted the nine new street trees around Lewes, aiming towards our vision of Lewes as a “town in the trees” or an urban arboretum. At the junction between South Way and Middle Way there is a grassy plot where two plaques record that trees were planted there to commemorate the Silver Jubilee of King George V in 1935. Of the three trees growing there in recent years, one had been removed and one was very dead and we were asked by residents to replace them. 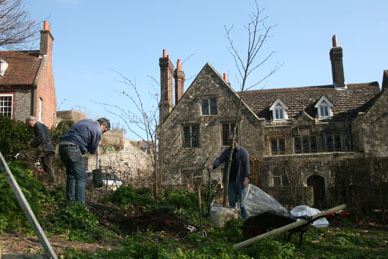 We have planted: a fruiting cherry, (Stella on Colt rootstock); a Whitebeam, (Sorbus aria Magnifica), and a red Crab Apple, (Malus Rudolph). In the cul-de-sac at the bottom of Valence Road, two Robinia trees had been badly damaged and we were advised that these trees were not vey hardy in our chalky conditions. At the request of residents, we have planted two specimen Liquidambar styraciflua Worplesdon, (Sweetgum), trees, one on each side of the road. These trees have lovely rich red leaves in the Autumn. In Abergavenny Road, opposite the gardens of St Pancras School, there used to be two Rowan trees with pink-white berries, (Sorbus Hupehensis), which were special to the neighbourhood because they had attracted a flock of Waxwings during the last cold winter. One of these trees was cut down in the summer and, having been advised that these Sorbus do not seem to have a long life on chalk, we planted three new Whitebeam, (Sorbus aria Majestica), near to the one remaining tree. Our hope is that the bright red berries of the Whitebeam will attract the Waxwings on their next visit to Lewes. 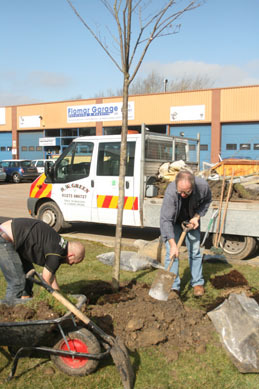 Finally, we revisited South Downs Road, where we had planted four trees in March 2015, to plant a Grey Alder, (Alnus incana), in the space which had used to be occupied by a burger van. This makes a fine row of five trees which meets our aim to increase the number of trees and improve the environment in this area of the town. 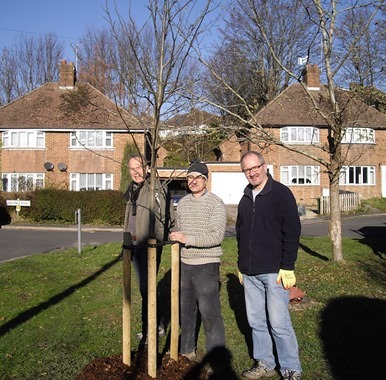 We planted four trees: a Norway Maple, (Acer Platanoides); a Wild Cherry, (Prunus avium); a Swedish Whitebeam, (Sorbus intermedia), and a Hybrid Elm, (Ulmus Americana Princeton) on South Downs Road. This planting will mature to soften views from the surrounding Downs – and we hope to extend it further along this industrial site in the future. 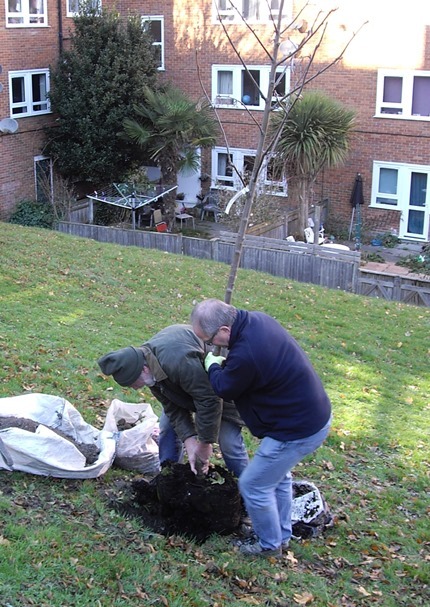 We also planted a new Oriental Plane tree, (Platanus orientalis Digitata), in the grounds of Southover School to replace a nearby tree which had been felled because of disease. 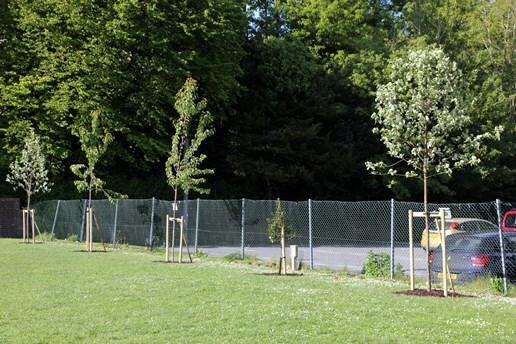 We designed, and helped fund and carry out, the planting of a row of trees in the playing fields of Southover and Western Rd Schools. Nick Jones, a member of our Trees Committee, has carried out a survey of Lewes street trees to identify where former avenues of trees appear to be at risk, for example, through old age, disease or felling of trees without replacements. We have put together a long-term plan to fill these gaps in street planting and hope to begin with this work in Winter 2016/17 in the De Warrenne Road area.